OK, this decision is BS, see it for yourself. There’s no way this will survive appeal. Hey folks, we still haven’t found a drummer for the band (if you know a drummer in or around Swarthmore please get them to contact us! ), so this is extremely premature, but what do you think of these band names? I would like to get some sort of temporary band name at least so I can name the band webpage, but I don’t know if I’ve found anything useable yet. Please leave a comment saying why you voted the way you did! Was the Civil War fought over slavery or state’s rights? There was a fascinating article on the demise of Firefly on fireflyfans.net, where the author says with some justification that the show’s heroes were patterned after an idealized Confederacy from the American Civil War, minus the slavery issue, and that this may have had a role in the show’s termination. The claim that I’m uncertain about, however, is that the author says the Civil War was not fought over slavery, it was fought over state’s rights. How much truth is there to this statement? I know Abe Lincoln said that he didn’t care about freeing the slaves, just preserving the Union, but I remember from my high school history class that slavery was a pretty big issue at the time. Then again, the winners write the textbooks, and I went to school in the North… how biased was my US History education? One of the issues with the Web is that blogs are often meant as a way to communicate with one’s friends, but it’s hard to keep jerks from finding them and using them against you without relatively inconvenient systems like password protection (that make it hard to show your entries to a new person). Which is of course one of the things that makes LiveJournal great! The Friends system makes it easy to add and remove people’s access privileges. Actually, part of my personal philosophy is that you shouldn’t do anything that you can’t defend, and that you should be willing to do and defend any actions that are morally right even if they are unpopular. As I think Confucious said, “the quality of a man is determined not by what they do when they are being watched, but how they behave in private.” If you have made a mistake in the past, it should not bother you to freely admit that you’ve been in error if you have in fact learned from your mistake. People have the right to change their minds, and it is OK, for instance, for you to have smoked marijuana in the past even if you are straightedge now. Otherwise, people wouldn’t be able to grow and develop, they would be locked into whatever morality (or lack thereof) their parents chose for them. The only problem is that privacy is necessary in oppressive, non-Libertarian societies where people will interfere with your life even when you’re just minding your own business, and they will try to enforce their morality upon you. If I were gay in a society that lynched gay people, I probably wouldn’t come out on my blog despite this personal philosophy. Arrgh! Plato is so full of crap! Why is his logic so broken? He was a pretty smart guy, why did he have to use BAD arguments when he was perfectly capable of using GOOD arguments? If he just wanted to get somewhere fast, without using good logic to get there, why didn’t he just save everyone’s time and declare assumptions by fiat? That said, Plato is pretty cool. Today I read up on Satanism, because sinsofthedove is vaguely Satanic and I wanted to know what that meant and why it appealed to her. Satanism isn’t just the polar opposite of Christianity, there are few variants, and the Satanists that we are interested in are the “occultists” or “modern satanists”, because that’s the group Finlay identifies with. Basically it boils down to a philosophy reminiscent of Ayn Rand or Nietzsche, and a religion where the self or ego is worshipped as “Satan”. I think I like most of what they have to say, check out their main organization the Church of Satan. I like the fact that they’re not evangelistic, and I like their emphasis on getting people to think for themselves. They have one weird thing on their agenda, they want all churches to be taxed (they are purposefully not tax-exempt), because a strong church shouldn’t need tax exemption to survive, and they seem to think that other lesser churches would upchuck and die if taxed? I’m not a big fan of taxes myself, the less taxes the better I say, but this certainly is an interesting idea, from an interesting group of people. Also, being dark all the time seems depressing. I go through periods of wearing all black, but I switch it up with my bright orange hoodie and my Hawaiian shirts. That’s my general problem with gothy people. Not enough variety. To misquote Henry Ford, “they’ll wear any color as long as it’s black”. Shake it up folks, don’t fall into a routine! Not that all Satanists wear black or anything…. Before I sign off here though, I do have a few things to say. First of all, you’re going to need a resume sooner or later, so start working on it now so that you just have to update it and submit it when the time comes to apply for internships or jobs. Don’t procrastinate on that, because missing out on an internship because you missed the deadline would be dumb. I now have to write my resume STAT! Second of all, don’t try to put your gloves in your pockets if there isn’t any room for them because you’ve already filled your pockets with fruit. If you do, your gloves fall out, and then you’re left with only one glove, like me, or like Michael Jackson. If you see a black biking glove that says “Trek” on it and has little silver reflecty pieces of fabric, please return to me, this is seriously my favorite pair of gloves and I am quite distraught! Are any of you Deviant Artists? I just set up my deviant account there… I’m not really much an artist, but hey, I can dream, can’t I? The reason I set up an account there was actually to test a feature of their userpages… If you look at my userpage you’ll notice a green button that says GeoURL. This is a quick way to search for webpages by geographical location, which ties into a site that Luke and I like a lot called Headmap. Headmap is a project to connect cyberspace with “meatspace”, by mapping URLs to physical locations and then wearing computers around so that you can superimpose the internet onto the world around you. With this futuristic system, park benches can have blogs, roads can have songs attached to them, and you can walk up to a building and see its website. For an analogy, consider hypertext, or “linking”. Usually when you write words, they are isolated, they have no meaning aside from the meaning that they have in your head. However, with hypertext, words can be connected to all sorts of information through the World Wide Web. Just think how much more potential a living website has compared to a dead, static book, and you begin to understand the possibilities that wearable computing and enhanced or “mediated” reality offer. 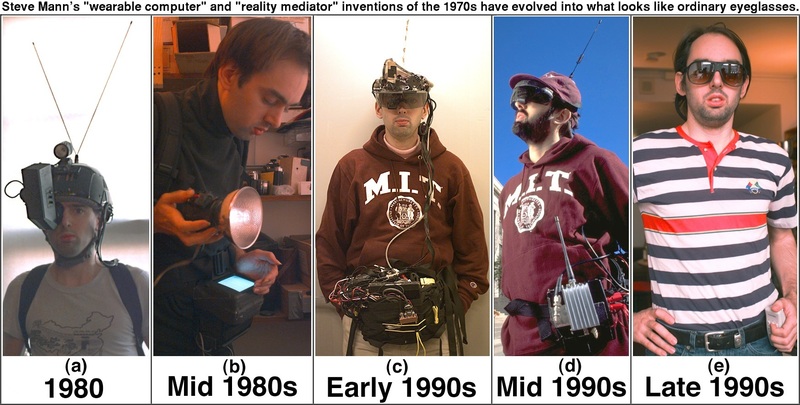 If you want to know what this future might look like, you’ll want to read up on Steve Mann, the cyborg professor, one of the pioneers of wearable computing. Despite (or perhaps because of) his extreme geekiness, he has a wife, which means there may be hope for me someday 😉 He has an interesting idea called Subjectright… he thinks that if we have intellectual property over our writings or musical creations, isn’t it ridiculous that we do not have property rights on ourselves and our likenesses and personal data? Are songs more important than people? It’s a well thought out philosophy, and his claiming of the right to control both outbound information (privacy rights) and inbound information (right to not be disturbed by spam) is wonderful. I’m not sure how I feel about everything he says, but I think it is logically consistent with the idea of intellectual property. Does this demonstrate the absurdity of intellectual property, or is it a good use of IP as opposed to the abuses that we usually see? Finally, as I mentioned on my last blog entry, I lost a black biking glove… have you seen it? Is it just me, or has Slashdot managed to slashdot itself? My friend Brian Rose and I are trying to put together a band here at Swarthmore, and we need your help! We’re looking for a drummer, bassist, and maybe a keyboard player (definitely if they can sing harmony). Check out the temporary band page to listen our songs and see if you might be interested. Tell your friends!